If you’d asked me a month or so ago if I’d ever have used a roller banner for my project comms I would have said I didn’t have budget for that kind of thing. A project banner for the staff canteen? It sounds like a luxury my boss wouldn’t have approved. But you know what? They actually aren’t expensive. 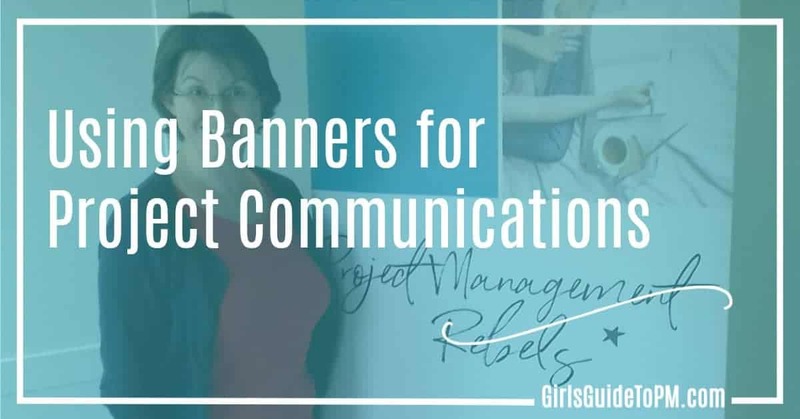 I’m often asked about project communications because people don’t know what to do to spread the word about their projects beyond emails, newsletters and presentations. 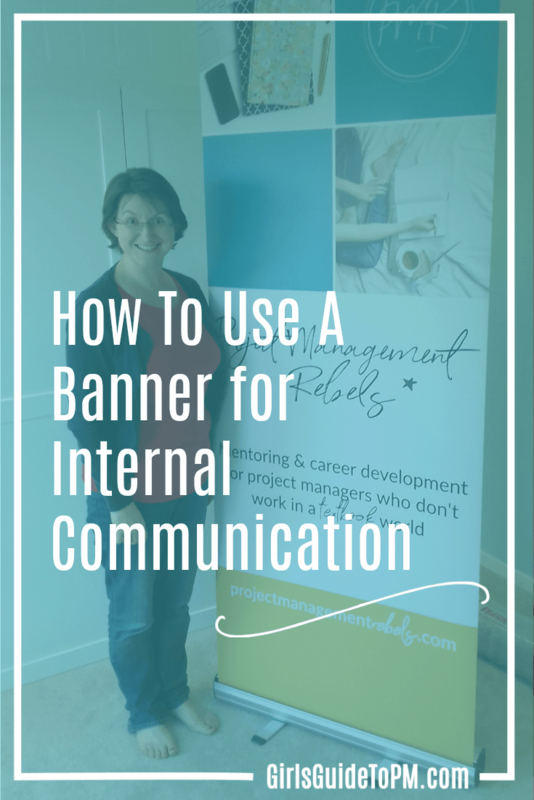 There are a lot more options for internal comms than just those, but personally I’d always considered roller banners to be an expense my project could do without. I was lucky enough to be asked by Portfolio Display to test out their banners so – in the spirit of full disclosure – I got mine free, but even if I’d paid for it I could still have had it for less than £40 (I did pay the delivery, but that wasn’t much). A roller banner folds up small and can be moved from site to site, so it’s a good option for project implementations or business change where you are moving locations and implementing locally. Mine came well-wrapped and then in a carry case so I could lug it from place to place if I wanted to. I can see lots of uses for a project banner in a delivery environment. In the reception area to highlight that your team are going through something big so to have a little patience. This last point about telling members of the public to be patient with staff using a new system is something that we have debated internally a lot. In the end, we left it up to individual reception managers to make the decision for their own teams. Some didn’t want to highlight that a new system was being used and that their team might struggle. Some thought it was better to point that out. 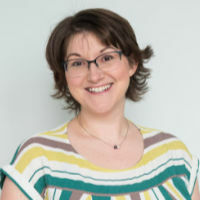 No one used a huge roller banner to do so – a discreet notice on the reception desk was as far as it went, but you could consider using a project banner if it was appropriate. I’m not a graphic designer, but I managed to design the one you can see in the photo. I used Inkscape which is free and generates a high quality output. I used graphics I already had and saved the whole thing as a PDF in the right size. That makes it sound easy, but having never designed a project banner before I did spend quite a lot of time on Pinterest looking at images of other people’s banners. However, if you have an in-house graphic designer in your Marketing team, you can just ask them to do it for you! I sent the artwork using WeTransfer as the file size was huge and it didn’t take long to arrive. Portfolio Display’s banner printing service was speedy (check out delivery times for your local print shop if you’re not in the UK). So you could leave getting your banner to almost the last moment but I wouldn’t recommend it if you have a particular event or implementation you are planning for. The banner is heavy, much heavier than I expected, so plan for that if you intend to carry it to a meeting. It didn’t come with instructions – or if it did I didn’t see them – and I didn’t find it intuitive. It’s not difficult to put together, but give yourself time to practice with getting it up before you need to do it in front of your team. I put it up in our loft conversion room and it just cleared the ceiling. I should have measured it first as we’ve just had the ceiling painted as we’re in the process of moving into that room and I was nervous about bashing it with the support pole. 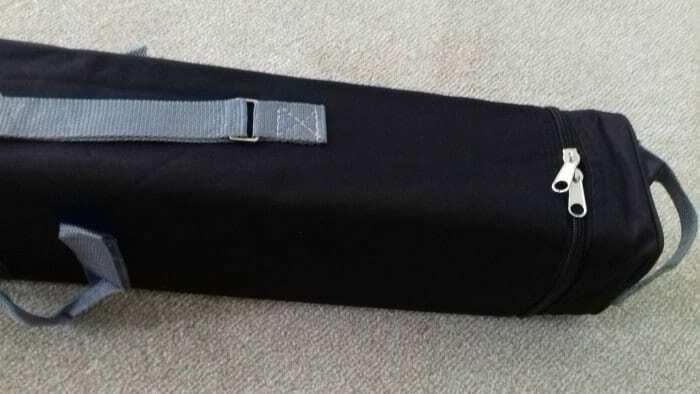 You’ll especially want to practice putting your banner down because if you want to keep it nice and not get the edges all frayed you have to roll it in to the stand really carefully. A friend who worked in PR and used these banners a lot was telling me that poor putting away skills slashes the usable life of a banner. It took me a few attempts to get it rolled up nicely. It’s not hard, but you do want to keep an eye on the edges and take your time. What’s My Banner All About? 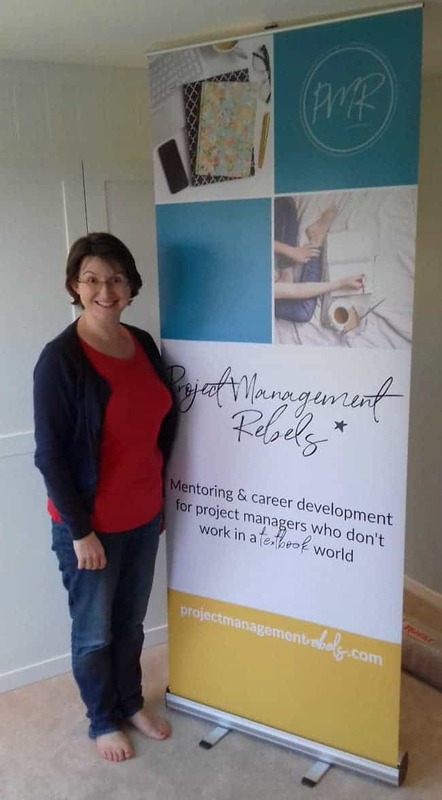 So what is this Project Management Rebels thing that you can see on my banner? It’s a mentoring and career development scheme with a difference. And that’s all I’m going to say right now! Watch this space because I’m working on something big and it’s going to be amazing! Thanks to Portfolio Display for sending me the banner. All opinions are my own.